If veganism had been hard (as many people, all too often, ask me whether it is) I could never have done it. If I’d had to eat bland salads, tasteless meals or yucky soups every day, I would have thrown in the towel instantly. Thankfully, veganism is a lot more fun than that. My current flatmate is German, and I spent a week in Germany when I was 17; back then I was a vegetarian, and I thought veggie options were thin on the ground in Berlin and Münich, where I spent most of my time. 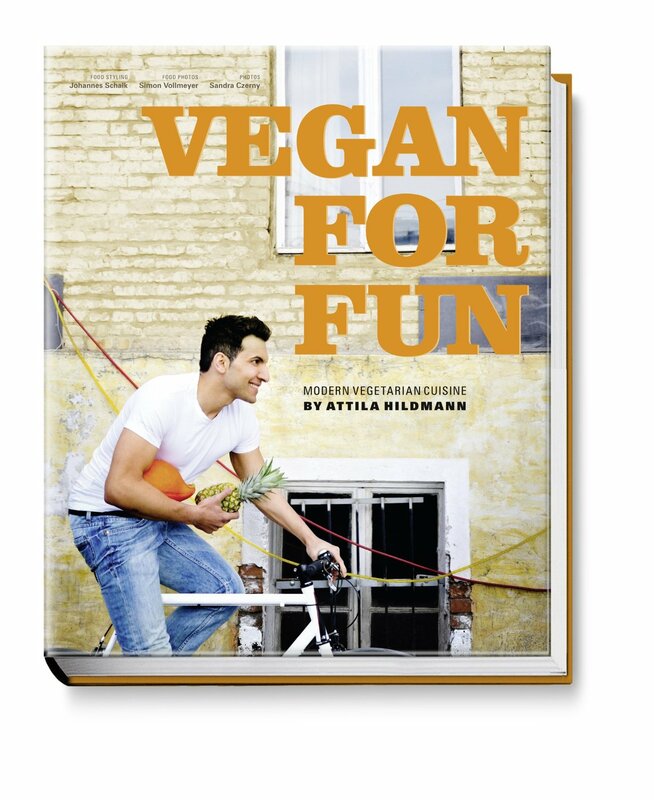 So imagine my delight when I discovered Attila’s book; a lot of typical German fare is effortlessly veganised and – dare I say it – looks and tastes even better than the real deal! My cooking has been in a bit of a rut lately, but Vegan For Fun has injected some new life into my cooking. I’ve tried sandwich flavours I’d never thought of before, made an extravagant and oh-so-simple dessert that pleased my non-vegan friends, and guess what – I had a lot of fun cooking and eating this food. Of course, I had to make a döner, which is a hugely popular meal in Germany. I may have slightly overstuffed mine, and I added ketchup just because, but man it was good and filling. My new favourite sandwich is undoubtedly the Cashew Dream Sandwich. Cashew butter in a savoury sandwich. Who knew. It was a party in my mouth. But we all know I adore gnocchi. I’ve tried making them before, but unsuccessfully – until now, that is. Attila’s foolproof recipe has made me a pro in gnocchi making (and now at last I know what to do with all those potatoes I get in my veg box). But guys – we need to talk about the Snicky Bars? Obviously based on Snickers, these are the bomb dot com (yes I just said that). I was never a huge Snickers fan until I met my Cookie Monster, who loves to eat all sorts of chocolate bars in front of me, knowing full well I can’t have them. These bars (which I made in triangles) hit that spot, bullseye. You’ve got to try these! That gives you 6 chances to win! Whichever way you participate, do make sure I have a way of contacting you! The winner will be selected at random by Friday 13 June 5pm Greenwich time. Giveaway open internationally! Disclaimer: I was provided with a free digital copy of the book but as always all opinions are my own. That snickers pie looks so yummy. Don’t be afraid to substitute food when your out. No need to get left with just a jacket potato and beans or a salad and chips. 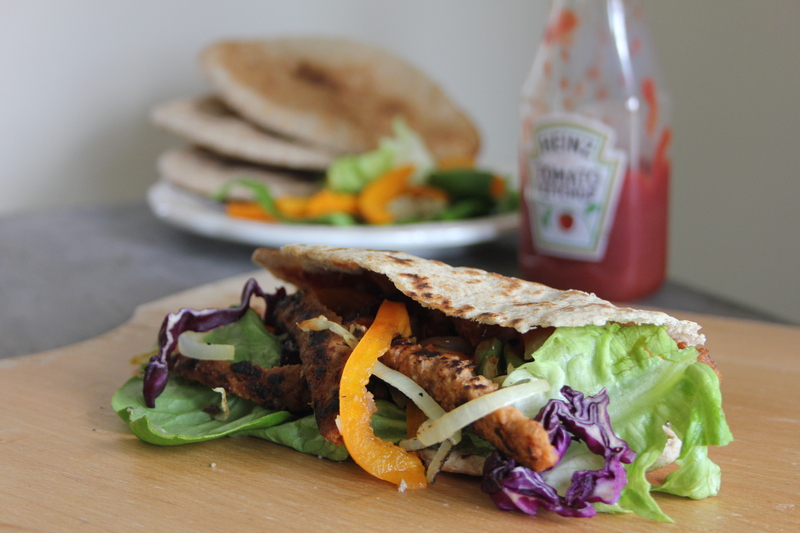 Substitute chicken in a wrap for example with mushrooms fried in oil. That sounds like a great book! It is amazing what a difference a new cookbook or recipe can do to jumpstart the creative food-making juices! The most valuable thing I’ve learned is to truly enjoy vegetables and fruit. Before they were a necessity, now I can actually appreciate their flavour! I even just ate a salad without any dressing–how crazy is that? I follow on Twitter, liked the Facebook, follow on Bloglovin’, and follow the Pinterest boards. I have learned that the key to veganism is community. I know very few vegans in person, but I have found so many inspiring vegans on blogs and social media that I feel as if I live in a supportive, peace-loving, kale-eating virtual hippy commune. Hi I’m from France. I once saw a television report about vegan lifestyle and I was impressed by Attila Hildmann. I thought that he might show to all men in France that you can be strong (and attractive :p) even if you don’t eat any piece of meat. Because here in France, most people think that vegetarians are usually scrawny guys. They even can’t imagine that you can be muscular AND vegan. I follow you on instagram but my account is private (feudaratifice). The most valuable thing I’ve learnt is cooking! I have to learn how to cook because I never did it before I became vegetarian. I used to cook a simple piece of meat with some rice or some pastas. So boring! Now I enjoy cooking vegetarian meals for my not-vegetarian friends, and they like it! I’m sorry if my english is imperfect. Your English is great! I was the same: once I made the decision to be vegan I had to start learning to cook. The most valuable lesson I’ve learned as a vegan is to always read those labels – you never know what kind of wacky ingredients manufacturers slip into their products! Hey Clem 🙂 I think the most valuable thing I have learnt since going vegan is that chocolate IS vegan!! When I first tried the diet/lifestyle I thought that only carob was vegan, and I even made some carob cookies! I am so grateful that there is plenty of vegan chocolate and chocolate recipes to enjoy! I don’t know how I would have lasted without them! I also ‘liked’ your facebook page 🙂 Thank you for the amazing opportunity to go in the draw to win ‘Vegan For Fun’ it sounds like such a fab book! Turning vegan really opened my mind to new combinations of flavours. It is important to keep trying new things! I think the most important thing I’ve learned as a vegan is, that every being on this planet has the right to live, no matter if it’s furry or not. and that there is absolutely no difference between a human and a non-human life. no one has the right to harm another without a reason. Going vegan was the best step I took in my life and it’s great that I can take this journey with my beloved partner, our relationship is better than ever. I’m following ou on Facebook. The valuable thing I’ve learned about veganism is to experiment! Try to change a recipe. Rarely has any creation been so off that we didn’t/couldn’t eat it, so it wasn’t a waste of food. Usually, it was a blessing that expended my menus. I also follow you on Twitter, Facebook, Pinterest, Instagram, and Bloglovin! When will we Know who is the winner?!?! 😆 It’s very exciting!! !